The Peoples Democratic Party (PDP) yesterday declared it would seek legal redress following Sunday’s declaration by the Independent National Electoral Commission (INEC) that the Osun State governorship election was inconclusive. 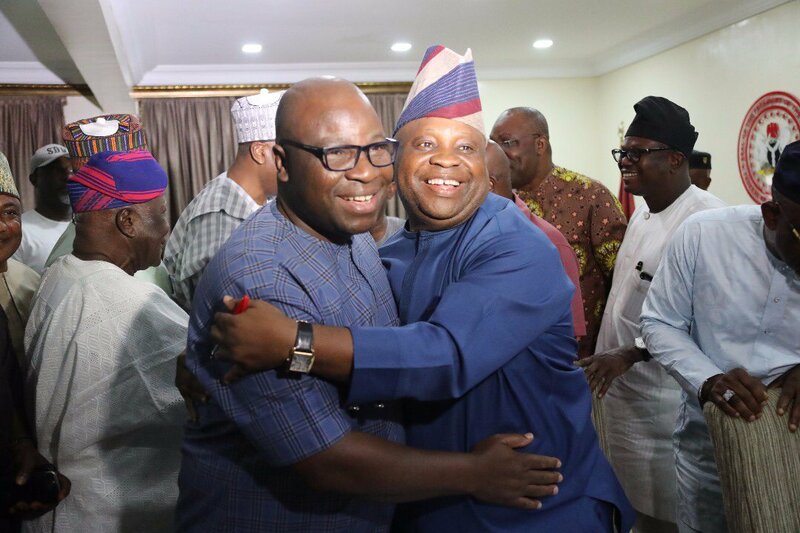 The party has maintained that its candidate, Ademola Adeleke, defeated his All Progressives Congress (APC) rival, Gboyega Oyetola. “Our electoral law is clear that once an election result is declared, INEC is bound to return a winner. INEC, in trying to play the card of the defeated APC, contravened the law by refusing to announce a return, even when the declared results have thrown up a winner,” the party said in a statement released by its national publicity secretary, Kola Ologbondiyan. Justifying its position, the PDP said: “Section 69 of the Electoral Act 2010 (as amended) states that inter-alia, in an election to the office of the president or governor whether or not contested and in any contested election to any other elective office, the result shall be ascertained by counting the votes cast for each candidate and subject to the provisions of sections 133, 134 and 179 of the constitution. The candidate that receives the highest number of votes shall be declared elected by the appropriate Returning Officer. The party consequently demanded the arrest and prosecution of the election’s Returning Officer, Prof. Joseph Fuwape, for allegedly succumbing to the pressure of the APC and declaring the poll inconclusive. “We demand that INEC Chairman Prof. Mahmood Yakubu immediately summon the courage to do the needful by declaring our candidate, Senator Ademola Adeleke, as winner,” the party added. The PDP’s decision seemed to align with the opinion of some lawyers who argued that INEC should have announced Adeleke as winner. Chief Mike Ozekhome (SAN) described the call for a re-run as a dangerous subversion of the electoral process, a blow to constitutional democracy and an ominous sign of the farce to expect in 2019. “INEC has earned for itself the inglorious reputation of holding inconclusive elections (Kogi, Bayelsa, et al); and working in cahoots with the ruling All Progressive Congress, always eager to do its dirty electoral bidding, to commit daylight robbery of votes. This they have just done to Adeleke’s votes to defeat the will and legitimate franchise of the good people of Osun State,” he said. Another lawyer, Boye Williams, said the results showed that APC polled 254,345 while PDP had 254,698. This, ipso facto, means the candidate of the PDP polled the majority votes, and INEC should therefore declare him elected. Dr. West Idahosa said that where elections were held and were cancelled, they remain cancelled. They ought not to form part of the counting process and should not influence the outcome of the elections for any reason whatsoever. But differing, human rights lawyer, Ebun-Olu Adegboruwa, appealed to the people of Osun to allow the re-run, mobilise themselves and reassert their will clearly and convincingly. Some PDP members meanwhile staged a peaceful protest yesterday at the Osun State headquarters of INEC, calling on the electoral umpire to declare Adeleke winner. “We are not morons in Osun State. We know what the 1997 constitution says. Osun cannot be cheated. We shall resist these shenanigan and conspiracy by INEC,” one of the protesters,” Akeem Adegoke, said. Also, some thugs attacked a prominent PDP leader and grassroots mobiliser, Alhaji Fatai Diekola. “Several other members of the PDP were injured in the attack,” the state chapter of the party said in a statement. The incident reportedly happened as Diekola prepared to hold a meeting with party supporters ahead of Thursday’s re-run. Oyetola however described the outcome as a violation of the people’s wish, saying it did not reflect the desire of Osun voters. He urged INEC to curb voter buying allegedly perpetrated by the PDP. In another development, the PDP yesterday screened its presidential aspirants ahead of its October 6 primary election. One after the other, the candidates condemned INEC’s inconclusive verdict, asserting Adeleke won. Senate President Bukola Saraki was first to be screened. Fifteen minutes later, he left for Osun State where he held talks with Senator Iyiola Omisore, who also contested the governorship poll. “We had a fruitful discussion with Senator Omisore. He used to be with us. And we believe he is helping us now. I am optimistic of a good outing for PDP. After meeting with him, I am more optimistic now that with his support, PDP will win. We are confident of a good outing. I am more confident now,” Saraki said. Omisore replied that he would be willing to support any political party that would implement his agenda of good governance, payment of full salaries to workers and prompt payment of pensioners’ allowances. This came as PDP Board of Trustees (BoT) chairman, Jibril Walid, said no agreement had been reached on the venue for the party’s convention. At the inauguration of the PDP national convention planning committee headed by Delta State governor, Ifeanyi Okowa, the deputy national chairman (south), Elder Yemi Akinwumi, had said Port Harcourt was the best choice. “Even though the deputy chairman said the issue of venue has been concluded, I want to say that the issue is still on and is not concluded, because there are many suggestions. We will look at all the suggestions. But I can assure you that the issue will be resolved. But for now, we are working around the clock to ensure that we have a very suitable venue accepted by everybody,” he said.